Wondering how you can get a Harwyn? 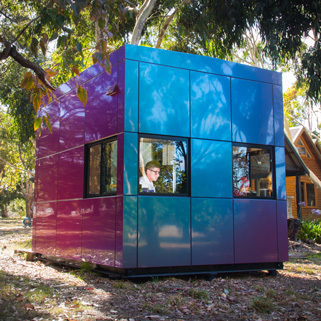 Keen to learn more about the prefabricated design? Explore this page to find out all the details of these modular rooms. And if you still have questions, please contact us. Q. After I pay a deposit, what’s next? You will receive a personal Account Manager who will take care of you every step of the way. Q. How long from purchase to delivery? Six weeks from the day of purchase, you will be cosy in the comfort of your Harwyn home studio wondering why you didn’t do it earlier. You can choose to pay for your Harwyn up front or starting at $500 per month, you can have your very own Harwyn and start working from home in style. Depending on which pod you choose, we can tailor a repayment plan to suit you. At the end of your plan you’ll own your Harwyn outright. No more wasted commuting time and office rental costs. Find out more on the costs page. No. Our prices are all-inclusive. You don’t pay extra for soil tests, site inspections, etc. Q. Does my Harwyn come with a warranty? Yes. Harwyn gives you a 3-year warranty and our Aluminium Composite Material (ACM) cladding comes with a 10-year manufacturers guarantee. Q. Can I claim it as a business expense? Yes. Consult your accountant to make sure you have all the details correctly in place to enjoy the tax benefits of investing in a Harwyn portable office for your company. Q. Do you offer financial options? Yes. From as little as $500 per month. Visit the costs page to learn more. Q. Can I rent instead of buy? It may be possible under certain circumstances. Contact us to discuss your details and needs. Q. How long does it take to install a Harwyn? 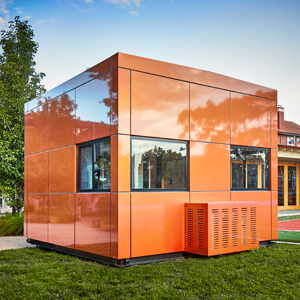 Depending on the site, our prefabricated pods can be installed in as little as two hours. Q. How much space do I need? Very little. Two and a half metres by two metres is enough. But even if you have a smaller space, contact us to discuss the options for your home studio space. Q. Can you put it in a sloping backyard? Yes. Harwyns can be installed on most sites. Q. How do you get it into the backyard – do you need access? In most cases, your Harwyn is lifted into position by crane. There are very few locations that can not be accessed by crane. Feel free to contact us to go over the particulars of your site. Q. Do I need any permits to have a Harwyn? We handle all necessary administration for you. Harwyn Designer Pods are designed to comply with all national and state regulations. Planning approval is often not required for a Harwyn. Q. Really? No planning approval is needed? That’s right. In most cases, you don’t need planning approval to install a Harwyn on your property. Q. Do you take care of the entire installation process? Yes. You don’t have to worry about a single thing. You choose the colours and leave the rest with us, and we’ll hand you the keys when we’re done. If you have any questions in the meantime though, feel free to contact us. Q. Are there different models? Yes. We currently have four models in the range. Yes. Every Harwyn is designed to exceed the rating of most domestic and commercial developments. The official energy rating for your Harwyn will depend on the particulars of the site and any optional extras you choose. Q. Can I customise my Harwyn? Yes. Visit the options page for more details. Q. Can I choose my own colour? Yes. Visit the colours page for more details. Q. Will the colour fade? 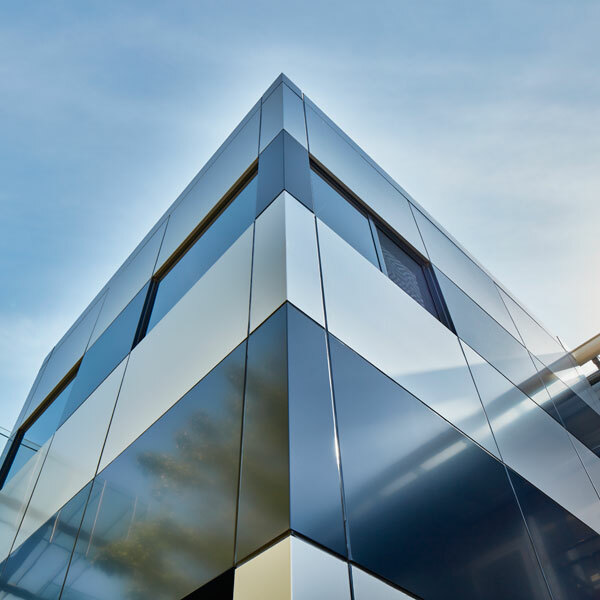 Our European cladding materials is guaranteed to keep its uniform look and dazzle for years to come. Yes. Harwyns are constructed with a double-layer protective system (including high-spec European materials). No water is coming into your Harwyn uninvited. Yes. Heating is available as an optional extra. However, thanks to its clever design your Harwyn is very well insulated so you can work from home all year round. If you required extra heating visit the options page for more details. Q. Will it be cool in summer? Yes. Your Harwyn will remain very cool relative to the outside temperature in summer. Your Harwyn is constructed with dual barriers against the Australian sun. The first layer of protection is the external skin, which acts as a barrier against solar radiation. Then there’s the second layer of fully insulated structural panels. Air conditioning is an optional extra, but as you’ll see in the above answer, your Harwyn is very well insulated. Visit the options page for more details on air-con. The soundproof properties are very good. If you would like a soundproofing upgrade, for a home studio perhaps, please contact us. Q. Does a Harwyn meet Australian Building Regulations? Yes. Harwyns are designed by professional architects, engineers and installed by professional builders. All of our designs exceed codes, regulations and energy rating requirements. Q. Will my Harwyn be long-lasting? Your Harwyn is built to the exacting standards of any architectural commercial installation. We build it to last. Q. Is a Harwyn at risk from hail damage? No. Your Harwyn is made from European Aluminium Composite materials (ACM) relied upon for the construction of major commercial buildings and installations. The look and feel is that of a luxury European car with the mechanical strength and protection afforded to situations that require the highest levels of protection. Q. Do you offer custom designs? We do not offer them as standard, but contact us to discuss something you have in mind. Q. What about lighting and electrics? All lighting and electrics are included in the price. Visit the options page to plan your ultimate home office. Q. What type of maintenance is necessary? Harwyns are made from durable European architectural materials and are completely maintenance free. They do not require painting, varnishing or any insect treatments even when installed outside in your backyard. However, we suggest that you give your Harwyn an annual sponge down to remove the soiling that will naturally occur in any environment. This will help keep your Harwyn looking like new. Q. What are some common uses for a Harwyn? Home office, backyard studio, art room, study space, music studio, meeting space, man-cave. Q. What happens if I move house – can I take my Harwyn with me? Absolutely. And what’s more, it’s easy too. Simply contact us and we will schedule your Harwyn for a move with the rest of your belongings. It’s the ideal portable space. Q. Do I receive customer support? Yes. When you purchase a Harwyn you will be given a Harwyn representative who will take care of you every step of the way.